About 40 teaching assistants packed into the designated bargaining room in Humanities 1, silently staring down representatives from the UC Office of the President (UCOP). 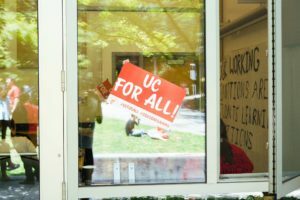 Many bore signs with the slogan “UC For All,” a few teaching assistants (TA) were conducting negotiations — all were there ready to fight for their basic needs. The union representing student-workers in the UC system, United Auto Workers Local 2865 (UAW 2865), went into its sixth bargaining session in three months on May 30. While founded primarily for car plant manufacturers, the union has come to represent hundreds of different working groups. Positions represented by the UC unit include readers, tutors, teaching assistants and research assistants. UAW 2865 is re-negotiating its contracts and codes of conduct of certain university processes, such as Title IX and judicial review. Ana McTaggart, campus chair for the UCSC chapter of the UAW Local 2865, led the charge on some of the union’s proposals. The total quarterly average teaching assistant salary for full-time work at the UC is $13,768, compared to $28,780 for working full time at the University of Michigan at Ann Arbor. Other union demands include improved victim protection and transparency during the Title IX judicial process, wage increases to keep up with inflation, more community support for student parents and a plan for affordable housing. The union is still waiting on an official list of offers by the UCOP, though no deadline has been established. “Our goal is to reach a multi-year agreement that recognizes the significant contributions that academic student employees make to UC by providing fair pay, family-friendly benefits, a safe workplace and good working conditions,” said Stephanie Beechem, media spokesperson for the UCOP in an email. The university recently offered a 2 percent wage increase for the next four years, according to McTaggart, which they said would not cover the costs of living as inflation continues to rise. “Two percent means eating four more times per month, right?” joked one union member in the crowd. The day-long rally commenced with a march across campus to the bargaining site, where the demonstrators remained all day, with refreshments and uplifting music to keep morale high. The bargaining session was hosted in a downstairs corner conference room with floor to ceiling windows, intended by the organizers to create a fishbowl effect on bargainers. Demonstrators gathered at the glass of the conference room and pressed signs to the windows in silence. A few UAW members shared personal struggles associated with the demands. Some students talked about their experiences with houselessness, some spoke on exorbitant costs of international tuition at the university, others about their struggles balancing school and child care. Theresa Hice Johnson, a UAW member, doctoral student in sociology and student parent, explained that while the UCs are better about providing family student housing than other colleges, the support ends there. In addition to issues of houselessness and child care, union members addressed the university’s Title IX process. McTaggart said the university is attempting to scale back the anonymous union grievance process for sexual harassment, which is an alternative option to Title IX, by mandating that reports go immediately to Title IX. The university’s revised process would involve naming the victim regardless of their wishes for anonymity. However, according to Stephanie Beechem, the university maintains that it is still early in the bargaining process and that its goal includes protection from sexual assault and victim care in compliance with state and federal regulations. According to McTaggart, the Academic Student Employees (ASEs) with the university would need a 60 percent pay increase to have comparable wages to other universities. ASEs often work 10-12 hour days, five days a week and freelance on the weekends to make ends meet, said UAW member, doctoral student and UCSC teaching assistant Karina Hurtado. If students express the need for more accommodations, they are pointed toward resources like Slug Support, which are not always helpful. The union plans to bargain with the university until its contract expires on June 30, after which it will continue to push for its demands. Previous articleWhat’s More Lost: Migrant Kids or US Humanity?